The advanced training took place at the site of Thyna, moving the focus from the site of Iunca for a variety of reasons. First, Thyna has diverse buildings and functions where the trainees can run a condition assessment from the urban scale to the scale of the building and its architectural details. Second, the characteristics of the site provides an opportunity to discuss and explore various methods of documentation and condition assessment of buildings/sites/architectural details, focusing on the mosaic as part of the whole building not only as a decorative architectural element. Third, the site provides an opportunity to test the participant’s skills to monitor change by re-assessing the pre-existed data using technology (i.e. 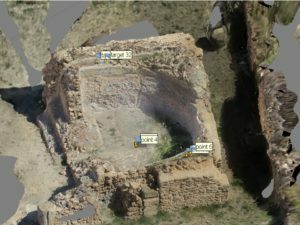 photogrammetry and GIS); the condition of the buildings and the mosaic has been documented and assessed before. 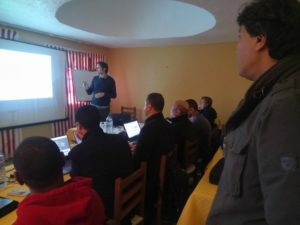 The advanced training comprised of three parts with a series of expert lectures, hands-on practical experience on the site of Thyna and in-class team work followed by presentations by the four groups. Fig. 1 Data collection on the site of Thyna. Fig. 2 Data processing in-class by each group. The main aim of the exercise was to run a condition and risk assessment using various documentation techniques, and prioritise the possible interventions to both the structure of the building and its mosaic. This was followed by putting an action plan that clarifies the and prioritizes strategies and actions required to achieve the possible interventions. The trainees were divided into 4 groups; 2 working on the Thermes de Mois, and one group for each of La maison de Dionysos, Therme Petit (Fig.1-2). Fig. 3 Plans of the selected buildings at the site of Thyna allocated to each group. Day 1 afternoon session started with a general overview and introduction to the training. Reminding the participants with the training methodology that was introduced during the last training in July. 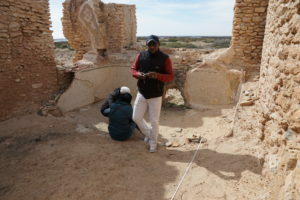 It connects the training materials and exercises, consists of three phases; Identification and documentationof the heritage site, Assessment and analysis,followed by the Response based on the first two phases. This was followed by introducing the exercise that will be running for the next two days at the site of Thyna, its main aim and goals. Fig. 4 The groups are conducting a condition assessment at the site if Thyna using the forms designed by the team at King’s College London. Fig. 5 The groups are conducting a condition assessment at the site of Thyna using the form designed by the team at King’s College London. 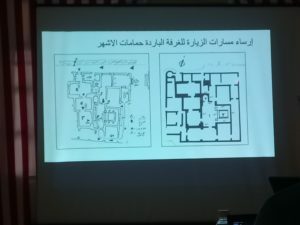 The whole morning was spent at Thyna working on the assessment of the three buildings, describing its condition, considering deterioration and risk and the possible interventions (Fig. 4-5). Then the trainees where asked to prepare a presentation for their findings, concluding with the top three priority interventions, which was followed by the whole groups and trainee’s discussion to agree on the priority number one for each building. The aim was then to put an action plan to establish a basis for the management of the site, and helps to clarify and prioritize strategies and actions required to achieve the priority number one intervention. Fig. 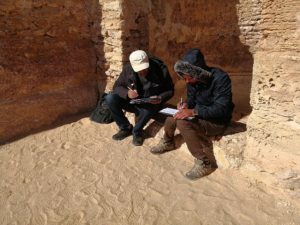 6 The participants are using various documentation methods to conduct a condition assessment on the site: here preparing the data using photogrammetric method. Fig. 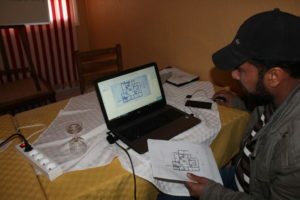 7 The participants are using various documentation methods to conduct a condition assessment on the site: here using the assessment forms as well as drawings and sketches. The morning session started with a brief discussion about each group’s priority number one intervention and the required action plan. That was followed by more fieldwork on the site exploring and documenting in more depth the condition and possible interventions upon which a series of specific actions connected to the very nature of the building itself and its wider context were proposed. 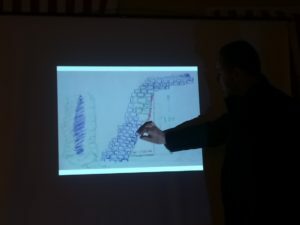 Each group had a participant responsible for locating the data on the drawings, and another one to do the advanced photogrammetric training (Fig. 6-7). The afternoon was spent processing the data and presenting their work. Fig. 8 An example of one of the groups’ work to run a condition assessment using photogrammetric method. Fig. 9 One of the participant is processing the condition assessment data using QGIS. In the afternoon, after processing and managing the data each group presented their action plan for the structure, proposing specific actions and the strategy to achieve this (Fig. 8-9). 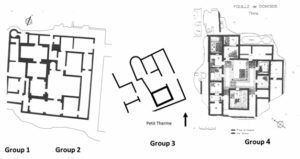 The groups then negotiated and agreed these points in relation to the whole site, not only the studied building, based on the observations of each (Fig. 10-11). Fig. 10 One example of the proposed actions plans by one of the four groups. Fig. 11 Another example of the proposed actions plans by one of the four groups. The morning session included in-class workshop to process the data collected using both GIS and Photoscan to monitor the change. Some of the participants started to apply the tools they have learnt on the first three days of advanced GIS training and imported the data collected in the field (condition assessment at Thyna) into a bespoke GIS project. Importing the site plans (Fig. 3) provided with a good basemap; subsequently, trainees started creating new shapefiles and reproducing and adjusting the condition assessment form to fit with the GIS ways of storing and representing data. In this way, it is possible to create a proper spatial database that will allow for a better decision making based on more accurate and quantitative dataset. Moreover, as the spatial database can be easily updated, this will help in monitoring the changes that occurred across the site/buildings between each assessment. Insights into the rate of degradation across the site can then be better monitored. In the afternoon, we delivered a lecture about the various documentation methods for condition and emergency damage assessment focusing on few examples from around the world (i.e. 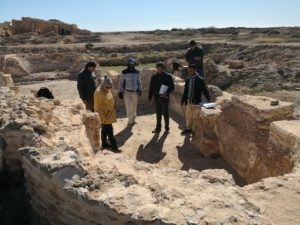 Syria) with a main focus on Sabratha (after the clashes last September 2017). A final lecture had put together each of the steps the participants followed in Thyna on the holistic approach of the training; moving from site documentation, value and condition assessment, to develop strategies and prepare an action plan (Fig. 12). It highlighted the steps that facilitate the management of the site, affecting the process of decision making, and the importance of the significance of the site and how it is being used by the local community and visitors. Fig. 12 The final lecture summarises the various methods and strategies that led to design an action plan to the site.